When he first started working at UAA nearly four decades ago as the school's sports information director, he wrote press releases on an IBM Selectric typewriter and then hand-delivered them to Anchorage newspapers and TV stations. 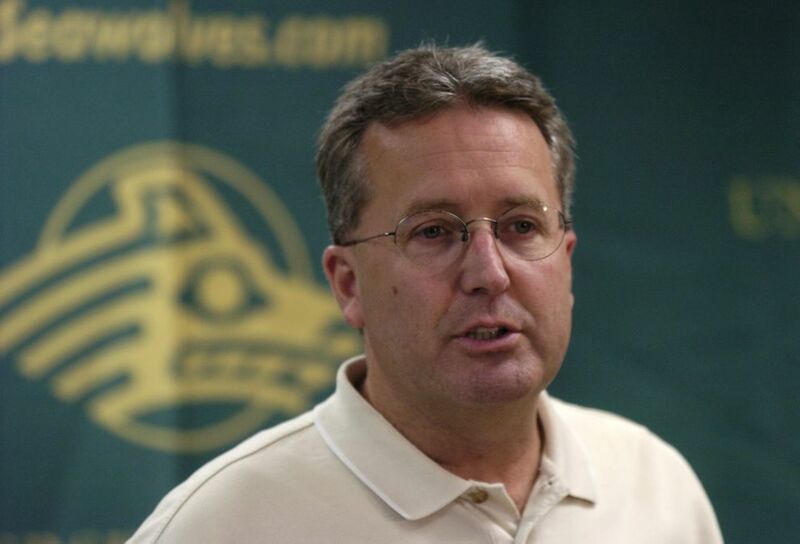 McDiffett, 63, is leaving UAA after 37 years. 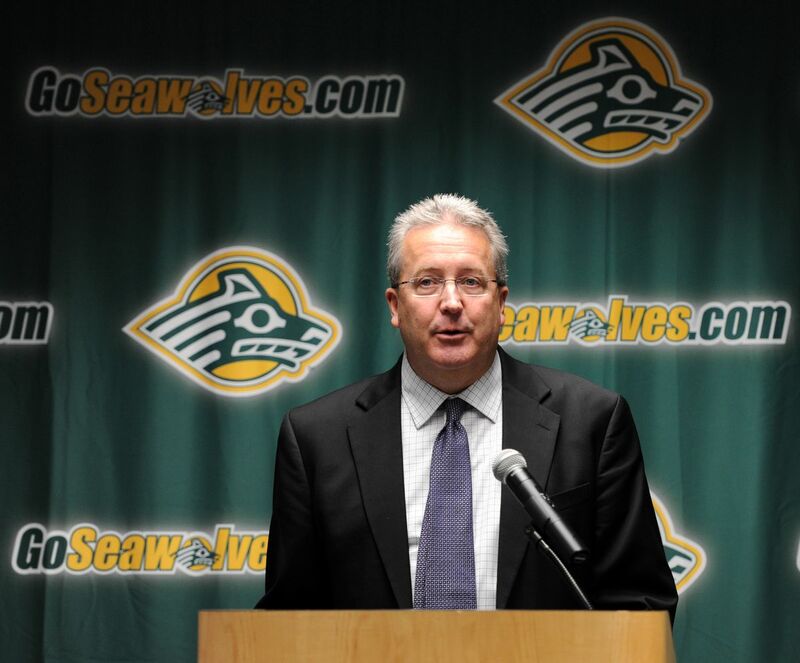 UAA began its NCAA Division II intercollegiate sports program in 1977, and McDiffett came on board in 1981. After 10 years as sports information director, he became an associate athletic director, and then the senior associate athletic director. No one has worked in the department longer. 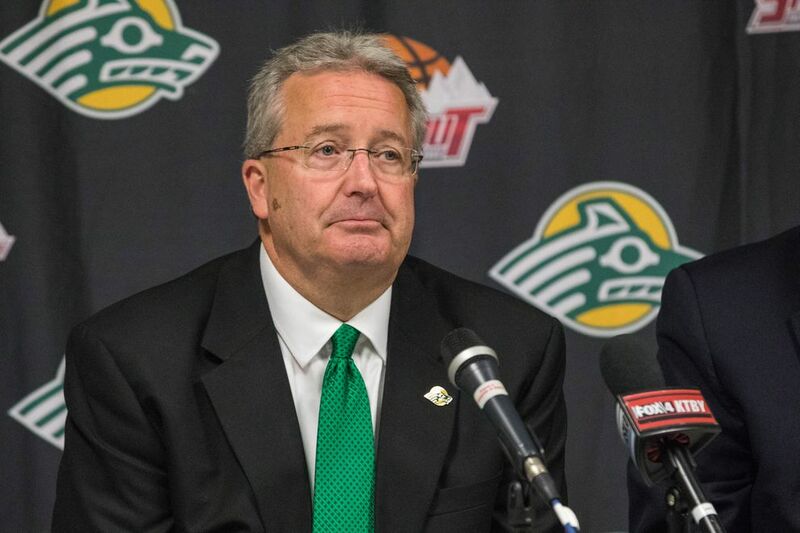 We spoke with McDiffett last week about his time at UAA, the highs and the lows, the wins and the losses. We asked, not for the first time, how he managed to help raise 10 daughters while working a job that required frequent out-of-state travel and lots of late nights and weekends (hint: his wife, Mary, is a saint). Q: Are you leaving Anchorage? A: The plan right now is we're going to relocate. We're not sure where. I have a few trepidations — it feels like jumping off a cliff a little bit. I've been doing this a long time and there is some comfort in the routine. We'll see what the next chapter brings. All of our daughters are west of the Mississippi — Houston, Austin, Kansas City, Seattle area and Phoenix. Our No. 9 daughter is a senior at Nevada-Reno. The other four are in Anchorage. No, I take that back. Our youngest graduated from East High in May and is going to Western Washington. Q: What are some of the biggest athletic-related joys you've had? A: The hockey team going back to the early '90s and seeing them get into the NCAA tournament. There were some great wins over league teams at the time. And then when they went back and swept Boston College in Boston. I was not there, but to see those scores come in was incredible. One of the biggest, most stunning moments was the men's basketball team beating Michigan on a neutral court in Utah. I remember all the calls we got the next day, from ESPN and USA Today, people were just stunned. I contend that was a bigger win than Chaminade over Virginia. It still gives me chills to think about when Morgan Hooe goes down against Western Washington (in the NCAA West Region championship volleyball match) and somehow comes back. They find a way to win and go to nationals. The crowd was so into it, it gave you chills. Thinking back to the crowds in the late '80s, early '90s at Sullivan Arena for hockey, I remember when Steve Bogoyevac scored the wraparound goal (in a 5-4 double overtime upset of Western Michigan in 1988 Nissan Jeep championship game). Your hair sorta stands on end because of the feeling, when you're the underdog and you've got so many people trying to will you to win. A: Here's what I always tell people: Tough losses always seem to be worse than great wins are great. They don't equal out. The bad losses seem like a bigger kick in the stomach than the wins are euphoric. We lost a student-athlete to a suicide, and that was just heartbreaking. Having the service on campus, those things you don't forget. Whenever you have a staff member depart, those things are no matter what circumstances because you became a family. Fans think sometimes (if a coach is) not winning, that translates into a bad person. We've had a lot of coaches here who didn't win a lot but weren't bad people. That's the hard part — it's a profession where winning and losing dictate so much of what happens. And what I know is all the coaches and all the student-athletes are doing their best to win. When they don't have success, those are never fun times. Q: You've had to fire a few coaches as an interim AD. A: Having to do that myself and be the person who has to make that decision, you take no pleasure in that, I can assure you. We don't have a lot of knuckleheads. We're fortunate, and some of that is because our coaching staff has gone out to create a culture. Steve Cobb did a great job of creating a culture (where) we want to compete at a high level but we want to help student-athletes achieve success academically and athletically. Those two things aren't mutually exclusive. What you find over time is if you take chances on questionable people, usually that doesn't work. We're not a win-at-all-cost program. We had a (department-wide) 3.33 GPA last year, which is stunning. And also our student-athletes and coaches contributed 2,700 hours of community service. Those are the things that matter. That's what makes it hard to leave. We've got good people. Q: You've been the interim athletic director three times. Did you ever want the job full-time? A: Yes, but I knew the job well, and it came down to a decision between a professional life over having a large family. Until you've sat in that seat, you don't know what that's like. In most cases it came down to, I wasn't willing to make that sacrifice of time beyond what I already was doing. I figured it out — there's an average of 80 home events a year, times 36 years, so that's 2,700 events I've been at. And here's what I know: while that's a lot, the athletic director is also at all those functions plus a lot of other meetings and off-campus events. It's just part of the job. My wife and I have had many discussions over the years, and it's a decision we made. It was too great a sacrifice from a personal standpoint. Q: How old is your oldest daughter, how old is your youngest, and what are their names from oldest to youngest? There's Dana, Hannah, Megan, Natalie, Caitlin, Bethany, Emma, Regina, Abigail, Leah. A: 11, and the 12th is on the way. The boys are winning 6-5 right now. Bethany is having No. 12 and does not want to know the gender, so this could tie it up or it could be 7-5. Growing up, if someone had told me I would live in Alaska and have daughters, I would have been like, OK, really? It's like saying, oh by the way, you're going to be on the moon. Never could have I imagined that, but having said that, what a wonderful life I've had. Unfortunately my wife had to raise our kids and me, truth be told. She has given up so much for all of us to have the life we've had. She's retiring from being a daycare provider — she's done that for 35 years in addition to raising our own kids. My life's been a piece of cake job compared to hers. If I had to take a road trip, she just made it work. She's the one that had the hard job. I can't tell you how many lunches she's made over the years, how many diapers she's changed. She's the rock of our family. Q: Did you plan to have so many kids? A: We talked about having a large family but I don't think either one of us ever imagined 10. Mary used to say that we were down to her mom and my mom as the people who would be happy to hear we were having another child. The tub scene of getting ready for church was something. In and out. I was the hair-drying guy. The girls would say dad was burning the top of their heads with the hair dryer because I was trying to get them through the assembly line to my wife, who would fix their hair and get them in the 15-passenger van. We're so fortunate to get to this point that hopefully we can find some time to spend with our grandchildren. That's the big impetus of relocating. We wanna watch our grandkids play ball or swim or be in concerts or do whatever. I think that's true of a lot of people in Alaska. A lot of people are transplants and they always face that distance. It's also what makes Alaska so great, is people reach out beyond their families. I knew someone who in his first year here he had 10 offers for Thanksgiving. That's the beauty of Alaska. Q: You and Mary met when you were both at Kansas State. Is it true that you got married the day you graduated? A: Yes, we got married the day I graduated. May 21, 1977. I didn't walk (at the graduation ceremony). Most of our friends were in college and I was the only guy (who was a senior) so we decided to get married that day so they could be there for the wedding. She was a year behind me and didn't wind up going back. Q: Because you moved to Anchorage right after that? A: The job opportunities out of college were tough, and we decided it would be better for both of us here. We got here and said I'd give it a year and we stayed 41. I'm as surprised as anybody. I said I'll give it a year because what I really wanted to do sports broadcasting. There weren't a lot of opportunities at the time so took a job sports writing at the Anchorage Times in August 1977. Steve Lindbeck was my first boss. I became sports editor in 1979 until I left (for UAA) in 1981. I remember coming (to UAA) the week before the Shootout in November 1981. Talk about drinking from a firehose. I was a one-man staff and I had a three-drawer filing cabinet and a desk and a Selectric 3 typewriter with correcto tape. Before that you had to have white-out. I remember doing press releases and stuff on the typewriter and we'd hand-deliver those around town. Eventually we got fax machines, which I thought were nirvana — how could it ever get better than that? It only took six minutes a page and we thought that was super fast. The technology has been able to change the way we communicate to so many more people and so much faster. Everybody now assumes everything is going to live streamed or on TV or there's going to be live stats. We used to have mimeographed stencils of box scores. Updating stats, you'd have to have one of those little calculators that used to cost $100 and now cost $1.75. I still have one at my desk, by the way. Q: It's hard to imagine you not being at UAA. A: It's been an honor to work here. The student-athlete at the end of the day, that's what our focus is, and it does kind of keep you young. They always come back to visit and I'm always amazed that they're older, because they're frozen in my mind. Some of those kids are in their 50s, and you start realizing how long you have been there. There's the joy of seeing people grow and develop when you're working in higher education, especially athletics. I've been fortunate to be in a place where I've been associated with some many good people who want to go out and do good things. You feel like you're adding value.